Today, the U.S. Supreme Court rejected Mumia Abu-Jamal’s appeal for a new guilt-phase trial. The Supreme Court has not yet decided whether to consider the Philadelphia DA’s separate appeal, which is attempting to execute Abu-Jamal WITHOUT a new sentencing hearing. In response to today’s rejection, Abu-Jamal’s lead attorney Robert R. Bryan will be filing a “petition for re-hearing” at the U.S. Supreme Court. Listen to Abu-Jamal’s own response recorded this morning, in an interview by Noelle Hanrahan of Prison Radio. A transcription of the interview is printed below. Readers are urged to contact the White House to protest this unjust ruling. Call (202) 456-1111 or visit http://www.whitehouse.gov/CONTACT/. Abu-Jamal’s appeal was based primarily on the U.S. Supreme Court’s 1986 Batson v. Kentucky ruling which stated that a defendant deserves a new trial if it can be shown that the prosecutor used peremptory strikes to remove otherwise qualified jurors simply because of their race. At Abu-Jamal’s 1982 trial, prosecutor Joseph McGill used 10 or 11 of his 15 strikes to remove otherwise acceptable Black jurors. The U.S. Supreme Court has not yet decided whether it will further consider the Philadelphia DA’s appeal of the 2001 and 2008 rulings of two lower courts, which held that Abu-Jamal deserves a new sentencing hearing if the death penalty is to be re-instated. Therefore, if the U.S. Supreme Court rules in favor of the DA, Abu-Jamal can then be executed WITHOUT a new sentencing hearing! Noelle Hanrahan, Prison Radio: Mumia, what’s your reaction? Mumia Abu-Jamal: So we don’t know anything. And you know, if it is the Batson issue, then it just shows you that precedent means nothing, that the law is politics by other means and that the Constitution means nothing. That a fair jury means nothing. Noelle Hanrahan: You said when I just first talked to you something about that it’s another day and how many days? Mumia Abu-Jamal: Another day? Three decades. Noelle Hanrahan: When did you stop being surprised? Mumia Abu-Jamal: When I was at pretrial hearing before Judge Sabo, and he denied the motion. I knew then that he wasn’t working with the Constitution. It did surprise me, and it really shocked me because I’d read the cases. I knew what the law was. I knew what the law books said the law was. I learned then that they’re not going by that kind of law, and apparently they’re not going by that kind of law now. If you read Batson and you read my case, then it’s almost as if you’re in two different universes. And in fact you are. You are. Noelle Hanrahan: Are there different rules for what type of people? Mumia Abu-Jamal: Well, there’s always been different rules for Black people, you know. If you read Batson, what will surprise people who have never done so, it has nothing to do with the accused, the defendant, the person on trial. Batson, in its own terms, says it protects the rights of those people who are allegedly American citizens, who are denied the right to serve as jurors. That’s what it says; that’s what it says. But in fact, how does it do that when it allows people to be removed, after Batson became law, for spurious reasons? Batson can be bested and beaten by exactly the way the DA’s office said it could be beaten: by lying, and by getting up and saying, “Well no, we didn’t have any racist reasons, and ah we just ah, we’re not…” Listen, listen to the video tape. [recording from prison: YOU HAVE 60 SECONDS REMAINING] Listen to the video tape and if that doesn’t tell you all you need to know, then you are deaf, dumb or blind. Noelle Hanrahan: Whose video tape? Mumia Abu-Jamal: The video tape of the DA, the training videotape of Jack McMahon of the Philadelphia DA’s office from 1986. “This Supreme Court decision again underscores the ‘Mumia Exception,’ where courts ignore or radically alter existing precedent to reject granting this inmate the same legal relief given to others raising the same legal points. “Ample evidence exists documenting improprieties by the prosecutor during jury selection at Abu-Jamal’s 1982 trial – the same pattern of improprieties that state and federal courts have cited in overturning over a dozen murder convictions in Philadelphia occurring before, during and after the trial of Abu-Jamal. Exposing the political underpinnings of Abu-Jamal’s decades long persecution, none of those overturned convictions involved a noted Black man charged with killing a white police officer whose case has become an embarrassment for America in the eyes of millions around the world. “If the current members of this Supreme Court simply applied the motto that is chiseled in stone above the entrance of their court building – equal justice under law – they would have voted to grant Abu-Jamal a new hearing on the mound of legal violations in this case instead of sidestepping their duty to ensure justice. “However, this Court, in the early 1990s, sidestepped that duty to justice when it denied Abu-Jamal relief on a First Amendment-related issue while granting relief on the same legal issue to a white racist prison gang member facing execution for a murder during a prison escape and a white devil worshipper facing execution for killing his grandparents. “The U.S. Supreme Court’s refusal to grant Mumia’s request for a writ of certiorari is incredibly surprising to me because it only takes four justices to grant the writ. Granting the writ would have allowed Mumia’s Batson claim of racism in jury selection to be brought before the entire court for consideration. Why I’m so surprised is that last year, in a 7-2 decision, the Supreme Court expanded Batson to order a new trial if the prosecution excluded just one potential juror on the basis of race. “The prosecutor at Mumia’s trial has stipulated he used 10 of his 15 peremptory challenges to exclude otherwise qualified Black jurors. This high strike rate (66.6 percent) is itself a prima facie indication of racism. Denying Mumia’s request for the writ cuts off any possible avenue of legal relief for Mumia. “Once again, a court, in this case the highest court in the land, the U.S. Supreme Court, has created what Philadelphia journalist and legal expert Linn Washington has dubbed ‘The Mumia Exception’ – that is to say a precedent that applies only to one person: Mumia Abu-Jamal. The decision in this case, which involved the high court’s refusal to consider and reverse last year’s Third Circuit Court of Appeals ruling rejecting Abu-Jamal’s claim that his jury was unconstitutionally purged of qualified Black jurors by the prosecution’s use of peremptory challenges to remove 10 or 11 Blacks from the panel, was particularly offensive since it was Justice Samuel Alito, at the time a member of the Third Circuit Court, who wrote an opinion stating that if even one potential juror is removed from a panel for reasons of race or religion, that trial’s verdict is fatally flawed and must be overturned. Alito’s opinion in that case was soundly reasoned and important, but apparently now, in his exalted position as Supreme Court Justice, Alito thinks the precedent needn’t apply to Abu-Jamal. “It is almost a certainty that the Third Circuit will revisit this issue on another death penalty case and that it will re-affirm the precedent, already in place in the Third Circuit, that any racial motive in purging a juror cannot be tolerated. Then we will be left with the Mumia Exception again, where laws are temporarily suspended to keep this one man on death row or in jail all his life. “The media reports on the court’s latest decision in this case have all gotten it wrong. The court was not ruling that there was ‘no bias’ in his jury, which was composed of two Blacks and 10 whites. What the court was refusing to do was hear his appeal of a 2-1 Third Circuit opinion that Abu-Jamal had not objected soon enough or with adequate evidence to what he claimed was a concerted effort by Prosecutor Joseph McGill to remove over 10 qualified potential Black jurors from his jury. “In a stinging minority opinion, Appellate Judge Thomas Ambro had criticized his two fellow jurists, asking why, for this one petitioner, they were raising the bar for demonstrating evidence of race-based jury selection, insisting that Abu-Jamal should have protested the removal of Black jurors at the time it happened, despite the fact that it was only five years later that such actions were even found to be unconstitutional. He also asked why his two colleagues were ignoring the precedents of both the Supreme Court and the Third Circuit. “Judge Ambro’s indictment of his two fellow judges now hangs over the reeking air of the Supreme Court Building in Washington, where placating the politically powerful police union and the right-wing death squads is seen to be more important than dispensing justice. “The Supreme Court did not rule on the appeal by the Philadelphia District Attorney of a federal district court’s overturning of his death penalty. The High Court could still reverse that ruling, which would leave Abu-Jamal facing death with no more avenue of appeal. Alternatively, if the High Court were to leave standing the Third Circuit’s unanimous decision supporting the district court’s overturning of the death penalty, the DA could ask for a new trial on the penalty alone, in an effort to convince a new jury to reimpose a death sentence. “If the DA were not to seek a new penalty phase trial, Abu Jamal would face life in prison with no possibility of parole and no more avenue of appeal of his sentence. “Philadelphia District Attorney Lynn Abraham, in a graphic illustration of the ugly politics that surround and continue to pollute this case, immediately grabbed the news of the Supreme Court’s decision as an opportunity to trumpet her own bloodthirsty credentials as a government execution-monger. Calling Abu-Jamal ‘nothing short of an assassin,’ Abraham once again repeated a fundamental lie of the Abu-Jamal death squad – that he was somehow gunning for Officer Faulkner as a rabid cop-hating Black Power advocate. “In fact, the prosecution never even attempted to make such a case. Even if one were to accept the story line created by Prosecutor Joe McGill for the jury at the trial at face value, with all the tortured and falsified testimony of prosecution witnesses, it was that Abu-Jamal, who happened to be at the scene of an altercation between his brother and Faulkner, came to his brother’s aid and ended up shooting Faulkner. 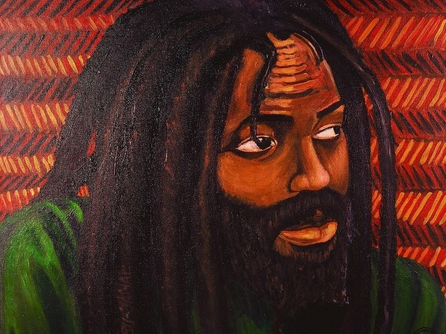 “According to a new CNN report, the U.S. Supreme Court has turned down Mumia Abu-Jamal’s petition for writ of certiorari, aiming to open the way for a new trial, as usual without giving a reason, while the court has still taken no decision on the prosecution’s petition for writ of certiorari, which aims at reinstituting the death penalty against Mumia, which was thrown out by a federal court on Dec. 18, 2001. “If true, as it appears to be, this report marks one of the darkest days in the history of the U.S. judicial system. An innocent prisoner who was consecutively framed by the police, the prosecution and a whole succession of courts has apparently just been denied the very least he can demand: not even a new trial, but a hearing about a new trial. “At the same time, this seems to mean that Mumia is in greater danger to be executed than ever before. “The U.S. Court can now decide at any moment that it will grant the prosecution’s petition for certiorari. And if so, it can decide within a relatively short time span – about this, one would have to ask experienced lawyers – that the prosecution’s demand to reinstate the death penalty is justified and that the December 18, 2001 decision to throw out the death penalty for Mumia is null and void. “From that point on, the legal barriers against Mumia’s execution would only be paper thin. Pennsylvania Gov. Ed Rendell (who served as the head of the District Attorney’s office in Philadelphia when Mumia was tried, convicted and sentenced to death for murder in 1982) has repeatedly made clear that should such a situation arise, he would lose no time in signing a new execution warrant. “In the light of what has been done to Mumia before, the courts decision to turn down his petition is not surprising. It’s another application of what has been called the ‘Mumia Law.’ Mumia is singled out for the most unfair treatment imaginable, reserved for true opponents of the system. “In J. Patrick O’Connor’s review of Mumia’s latest book, ‘Jailhouse Lawyers,’ O’Connor mentions the fact noted by Mumia himself that of all the prisoners in the American Gulag of 2.5 million people, who are incarcerated in one or another form, the ‘jailhouse lawyers,’ the ones fighting for the rights of other prisoners and their own rights, are singled out for the most brutal and inhumane treatment by the guards and the prison administration. “The same appears to be true for the courts. I have talked to lawyers, including people who have worked as clerks for State Supreme Court judges, and I was told that Mumia’s brief to the U.S. Supreme Court was extremely strong and convincing, but all the same, the brief was turned down, and the U.S. Supreme Court rejects to even consider the case. “This despite the fact that the brief cites a whole litany of precedents where the Supreme Court itself and the various federal appeals courts in the country have granted relief in exactly the same circumstances where the U.S. Supreme Court now says it is not even ready to deal with the matter. “In sum: Here, too, Mumia is being punished for being who he is and acting like who he is, for being Mumia and acting like Mumia, which is exactly what has sparked such a strong international movement around this particular case over the years. “This is truly a horrible message. “From our side, I think that means we must step up the fight: The absence of racism in jury selection and during the trial as a whole can’t be conditioned on some proper behavior of the defendant as defined by ‘the master.’ It is either a right that applies to everybody or it doesn’t offer a real guarantee to anybody. “On a separate point, the consequences are alarming, that, as reported by CNN and others, the court has already turned down Mumia’s petition while it is still considering the prosecution’s brief. “And by alarming I mean just that. ‘Alarming’ doesn’t and mustn’t mean going into the shock mode – on the contrary, this is the point where we must raise hell and mobilize anything and everybody in our powers to prevent the ultimate injustice, Mumia’s execution, from happening. “That said, the prosecution of course has a lot to fear from even a new sentencing hearing ‘for’ Mumia. Facts would come out that would call their entire card-house of lies into question and in fact would bring it down in no time at all. So it’s only too understandable that this is something they are fighting against in ‘tooth and nail’ fashion. “To sum it all up, this is not the time to bow our heads in disappointed silence. On the contrary, at no point in this whole struggle is it more important to say that THE STRUGGLE FOR MUMIA’S LIFE AND FREEDOM CONTINUES! “Brave activists in Philadelphia have stood by Mumia right from the beginning, joined by others at the end of the ‘80s. Even in a far away country such as Germany, activists had joined the fray already in 1989. Others all around the world joined, and this would be exactly the wrong point to give up. “As far as I understand, even now the defense can ask the court to reconsider its decision. Our first and foremost task as a movement would be to support such a move with all that is within our powers. Apart from that, we must raise hell against the DA’s countermove to have Mumia executed. And third, last but by no means least, we must not give up our struggle to finally free this innocent man, by any means possible and by any means necessary. “On this last point, we will need to have intense and open consultations about what to do next. As far as I can see, there are various options here, and apart from what lawyers can still do (for example, ask the court to reconsider), two things seem promising to me: 1) a massive campaign about the facts of the case, which show that Mumia is innocent of murder, and 2) a campaign for an amnesty for all the prisoners we consider ‘political’ and who have already served such an incredibly long time. “I think this latter point is necessary anyway, as will be evident to at least some of those who read the names Herman Bell, Veronza Bowers, Romaine ‘Chip’ Fitzgerald, Jalil Abdul Muntaqim, Leonard Peltier, Ruchell ‘Cinque’ Magee, Mondo we Langa, Hugo ‘Yogi’ Pinell, Edward Poindexter, Russell ‘Maroon’ Shoats, Herman Wallace, Albert Woodfox and so many others whose names don’t spring to mind so readily or who we haven’t even heard about. “The long and the short of all this is that this is a serious setback, but that the struggle continues. “The U.S. Supreme Court refused on April 6 Mumia Abu-Jamal’s appeal (writ of certiorari) for a new trial based on the racist exclusion of Blacks from the jury panel (using 10-11 of his 15 peremptory strikes) in his 1982 frame-up murder trial. The decision left in place Mumia’s conviction and turned a blind eye to its own ruling in the famous Batson v. Kentucky case and related decisions that nullify murder convictions where Blacks are systematically excluded from juries without cause. The court ruled without comment. “Even worse, the court left open the possibility that it might consider Pennsylvania prosecutors’ cross appeal to re-instate the death penalty without granting Mumia a new sentencing hearing. A previous ruling had voided the jury’s imposition of the death penalty on the grounds that ‘hanging’ Judge Albert Sabo had improperly instructed the jury regarding mitigating circumstances sufficient to impose a sentence of life imprisonment without parole as opposed to execution by lethal injection. Should the court later rule in favor of the prosecution, an order for Mumia’s execution by lethal injection could be signed by the Pennsylvania’s governor and Mumia could be executed in approximately 90 days. “Meanwhile, Mumia’s attorney, Robert R. Bryan, told this writer, ‘We have lost a battle but not the war.’ Bryan plans to file another petition before the Supreme Court for a re-hearing on a critical issue related to the death penalty, thus keeping Mumia’s legal options alive, at least for the time being. “Jamal, an award-winning and innocent journalist and author, has been on Pennsylvania’s death row for 27 years. He has won broad international support for his struggle for a new trial and freedom. Organizations ranging from Amnesty International and the European Parliament to the NAACP, the Congressional Black Caucus, the presidents of France and South Africa and civil and human rights organizations around the world have repeatedly challenged the racist and anti-democratic aspects surrounding his conviction. “Massive and repeated protests organized by groups including the International Concerned Family and Friends of Mumia Abu-Jamal, (215) 476-8812, and The Mobilization to Free Mumia Abu-Jamal, (510) 268-9429, have played a key role in the ongoing fight for Mumia’s freedom. They are presently planning joint campaigns with several groups that require the solidarity of all. Hans Bennett, born and raised in the SF Bay Area, moved to Philadelphia in 2001 to photo-document the movement to free Mumia Abu-Jamal, the MOVE 9 and all political prisoners. He has also documented the anti-war movement, media democracy, anarchism and other radical political movements. In 2007, he co-founded, with German author Michael Schiffmann, the media-activist group “Journalists for Mumia” (Abu-Jamal-News.com). He can be reached at destroycapitalism@hotmail.com. Editor’s note: The following interview by POCC Minister of Information JR with Christina Swarns, director of the Criminal Justice Project of the NAACP Legal Defense and Education Fund, and a member of Abu Jamal’s legal team – he mentions her in his interview with Noelle Hanrahan of Prison Radio – was broadcast today, Monday, April 6, on KPFA’s Flashpoints. The interview begins 46 minutes into the show. Thanks for this. I posted it to my Facebook profile, but the artwork’s not coming up, for some reason or other. That’s been happening when I post Bay View stories to Facebook for awhile. But JEESUSSSSS!!!!. . . That prosecuting attorney, talking about why he always, strategically, tries to empanel the stupidest white jurors he can possibly find!!!!!!! I’m always telling myself to can the redundancies, like “It’s an outrage. . .it’s a disgrace. . . can’t believe it,” and remind myself that nothing should shock, probably never should have, but it never works. I’m always shocked and outraged again. This is old crap. Jamal will spend the rest of his life in prison ,and rightfully so. He is a proven convicted and affirmed murderer…no political prisoner bullschmidt..just a convicted murderer of another human being. To those on the West Coast, and those across the sea, you have been duped and used just as MOVE has used a certain “journalist” to spread their propaganda. Fools led by fooled fools. Facts bring Truth…Truth brings Justice…Mumia Abu Jamal…GUILTY of murder. Jon Pisano YOU are a fool and a racist if you believe and still believe that Jamal is guilty after watching Mumia Abu-jamal, A Case for reasonable Doubt. Jon Pisano YOU are a fool and a racist. If you believe and still believe that Jamal is guilty after watching Mumia Abu-jamal, A Case for reasonable Doubt, you should smack yourself.